Generally, deserts do not have a lot of water. It is the missing part in the desert. The Western Desert, however, has plenty of water. The trouble is that it is not easy accessible. The water is trapped in subterranean chambers. In the depressions of the Western Desert, however, the water is easily accessible. Here the floor of the desert is near or below sea level and the water gushes from natural springs or can be tapped by drilling wells. The farther south the water source, the fresher the water becomes. The oases of Bahariya, Dakhla and Kharga have the sweetest and most plentiful water supplies. The Siwa oasis has highly salinized water. Not all the springs in the oases are sweet. Many springs are brackish and unpleasant in taste. All these springs, however, contain gases and minerals of great medicinal value. The Western Desert has many springs and wells. If the water bubbles up naturally from the earth, it is called a spring (ain). If the water has to be coaxed from the earth by man, it is called a well (bir). Almost any time a well is drilled for irrigation, the water comes out hot and mineral-rich from aquifers as much as 1 km below the desert. Wherever it gushes from the pipe, there inevitable forms a large pool. Generally these days a cement tank is built, with a sluice system to control the flow of the water into the irrigation channels. There are an amazing number of wells in the desert, also with historic sites around it. Many of them are cold-water wells. The majority of the wells in the Western Desert, however, are hot-water wells. The wells that produce hot water are deep and described as thermal. They are one of the great pleasures of the desert. The experience to bathing in one of these wells, particularly at night, can be unforgettable. With no bright city lights to interfere, the stars shine exceptionally bright. Etiquette demands that you wait your turn if the well is occupied. Women should bathe in an on-piece suit with t-shirt on top. Keep in mind that the minerals in the water can stain whatever they get on. Consider it as a free souvenir of a night to remember. In Siwa Oasis there are dozens of springs in which travellers can bathe. Most of them are surrounded by palm groves. And … they have wonderful bubbles. You can watch the bubbles race through the clear water from fissures in the rocks at the bottom of the pools, rising to tickle the toes, belly, and nose on their way to the surface. Two springs are famous, not only for the pleasure of swimming in their bubbling waters, but also for the history and events that have taken place around them. Cleopatra’s Bath (Spring of the Sun) is the most famous one. Legend maintains that Cleopatra swam here, when she visited the oasis. Ain Tamusi (Spring of the Bride) is the second famous one. In the past a young bride would come with her friends to bathe on the eve of her wedding. Here she would take her silver virgin’s disc, the asrim, from around her neck and pass it to a younger sister. The closest spring to Siwa town is Ain Arais, a cool, inviting waterhole with a grotto-like bottom. Fatnas Spring is an idyllic setting among palm trees and lush greenery. Great place to watch sunset. Ain Qurayshat is the largest spring in Siwa. This is a pleasant place to take a bath, for the view, which is really spectacular. Bir Wahed (Well One), hidden among sand dunes, was made by Russians, looking for oil in the 1960s. Instead of oil they found water. Nearby is a petrified forest with the large trunks of ancient trees. Bahariya Oasis has more than 400 springs and wells that are rich with minerals and sulphurous, warm and cold. People believe that the mineral and sulphurous hot wells are very effective in healing many illnesses, like rheumatism and skin diseases. The Ain Bishmu roman hot spring flows out of a fissure in the main cliff along the border of Bawiti and Qasr and cascading down the cliff the water falls into a natural basin. Ain Bishmu runs into Ain Bardir. Ain Bardir is a colder roman spring at the bottom of the cliff, which also runs into a natural basin. Ain Muftilla is a spring with a historic site nearby with a temple complex with four chapels which were built during the reign of the Pharaoh Amose 2. At Bir Mattar we find a hot and a cold well, side-by-side. The old well, a cold-water well used for centuries, began to dry up and a new well was drilled deep into the earth. With the use of a pump, however, the old water well is still working beside the new drilled very hot water well. Bir Ghaba (Well of the Forest) is a hot water well located in a grove of eucalyptus trees. It is a wonderful spot to get away from all. Bir Sigam is the nicest spring, in both temperature and setting. There are more than 100 springs ands wells spread in the Farafra area. 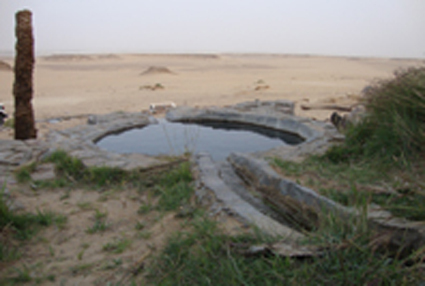 Most of the wells are used in aggregation of the cultivated land in the oasis. Some of the wells in Farafra have become favourite touristic destinations, because of their warm water temperature and the slight percentage of Sulphurous in the water. The wells are very popular for swimming and relaxing. It is a perfect way to finish a desert safari. Ain Besay is an archaeological site that consists of an ancient cemetery, two mud brick buildings, a few rock tombs and a small chapel. At Ain Gallaw you’ll find a few rock tombs and some Coptic inscriptions. There is also an ancient aqueduct here. Ain Serw (Magic Spring) is a spectacular beautiful spring. It has a strange magical story. The water starts to flow and running once any visitors get approach to it. Ain Khadra (The Green Spring) was once an important rest stop for caravans travelling from Farafra to Assyut. The old Roman Spring is a remarkable site, totally unlike any other spring. Bir Sitta (Well 6) is a steaming hot well of 38º. Bir Sab’a (Well 7) is a steaming hot well of 38º. Bir Regwa or Bir Akhbar (the Great Well). Although there has been created an artificial lake just north of Mut to drain the water from the fields, the main water source are still springs and wells. The whole length of Dakhla is dotted with hot springs. It has over 520 wells. The Old Kingdom settlement Ain Asil (Spring of the Origin) was the beginning of the Abu Ballas Trail. Its rulers were responsible for supplying the pottery, water, grain and other provision for the stations along the desolate, waterless, remote trail that led deep into the south-western desert. At Ain Gadida you’ll find one of the oldest Christian sites in the desert, dated to the 4th century. Bir el Gebel (Well of the Mountain) is one of the prettiest springs in the entire Western Desert. It has a hot spring, a small picturesque village, interesting yardangs, lush fields and wonderful dunes to the foot of the scarp. 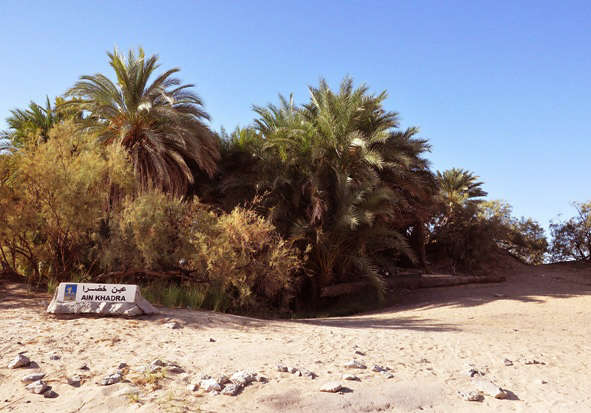 The spring is situated in a small palm grove. There are hundreds of springs and wells in Kharga. Most of them have been running non-stop night and day for thousands of years with no sign of abating. Ain Saff (Spring of Palm Fronds) is tucked into the base of the foothills of Gebel el Teir. It contains three structures: a Christian burial chapel, a barrel-vaulted tomb and a Christian church. Archaeologists believe it could be the church of the banished Bishop Athanasius. The cliffs around Ain Saff hold various clays and coloured stones. Ain Dib (Spring of the Bear) is an ancient Roman site with several mud brick ruins.